The programme benefits from the clinical and epidemiological expertise and the renal cell carcinoma samples that are available through International Agency for Research Cancer in Lyon and their collaborators, and the Cancer Research UK Centre in Leeds. These groups provide access to the largest and best-characterised collections for these studies that are available worldwide. 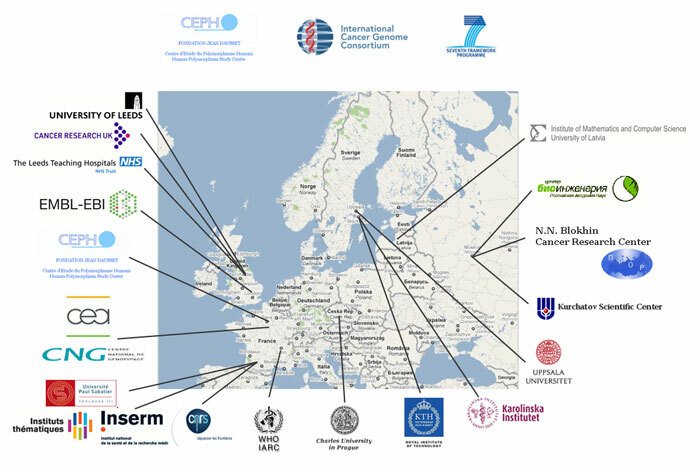 The programme draws upon genomic facilities and expertise available at the Centre National de Genotypage (CNG) in Evry, France, the Fondation Jean Dausset CEPH in Paris, France, and the Biotechnology Institute in Moscow, Russia. These institutes have large genotyping and sequencing facilities that will be used in these investigations. The CNG manages the FP6 project READNA on the development of new sequencing technologies which will be brought into CAGEKID as they become deployed. Data analysis will be performed using tools that have been developed in these laboratories and at the European Bioinformatics Institute (EBI), which is a partner in the proposal. Validated markers have been identified in specific genes, antibodies will be obtained and their tissue distribution studied using the pipeline established for affinity proteomics at the Royal Institute of Technology in Stockholm (www.proteinatlas.org). Ethical and societal aspects will be addressed in CAGEKID under the responsibility of A. Cambon-Thomsen (INSERM U 558, Toulouse) who is a member of the ICGC sub-committee dealing with these issues in an international context. Other members of CAGEKID at the IARC (Partner 2), CNG (Partner 10) and CEPH (Partner 1) participate in the scientific steering group and other working groups of the ICGC.